Lock in a great price for City Park Hotel – rated 8.4 by recent guests! Cosy, quiet and very clean hotel. Staff is very helpful, breakfast is great with a very good coffee. Hotel provides cold and hot snacks 24/7. Room is very clean, comfortable beds and pillows. Absoluletly loved it, thank you! Very clean and quiet. I would recommend to book rooms with garden view, not wit backyard view. Very friendly stuff. Great location, secured parking, clean. Nice staff. Clean, location, the Hotel Manager, she was very nice with a great service! Very nice hotel, conveniently located just a five-min cab ride away from the main train station and a 20-min walk from the old town. 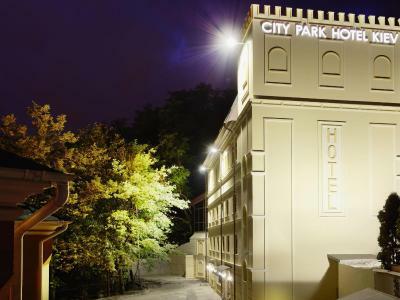 City Park Hotel This rating is a reflection of how the property compares to the industry standard when it comes to price, facilities and services available. It's based on a self-evaluation by the property. Use this rating to help choose your stay! One of our top picks in Kiev.Located in Kiev’s city center, City Park Hotel is a boutique hotel that offers luxurious rooms with air conditioning, free WiFi and a plasma TV. Free private parking is possible on site. All rooms of Hotel City Park are equipped with a mini-bar, satellite TV and a private bathroom. Some of the rooms have a private sauna. Guests can benefit from the 24-hour front desk service City Park provides. It also has a ticket service and a tour desk. The coffee bar serves a buffet breakfast every morning. In the afternoon and evenings it serves snacks and drinks. City Park Hotel is within walking distance of the Sophia Cathedral, the Golden Gates and the National Opera. It is only a 10-minute drive from Independence Square and Sophia Square. When would you like to stay at City Park Hotel? Spacious suite featuring a separate sitting area with sofa, and a private sauna. The marble bathroom includes a bathtub and slippers. Hotel surroundings – This neighborhood is a great choice for travelers interested in walking, history and architecture – Check location Great location - show map Guests loved walking around the neighborhood! House Rules City Park Hotel takes special requests – add in the next step! All children under 12 years are charged UAH 543 per night for extra beds. City Park Hotel accepts these cards and reserves the right to temporarily hold an amount prior to arrival. Please note when booking 5 rooms or more that different payment and cancelation policies apply. Not clean. No clean towels. Extra charges and deposits at the reception. Took too long to check in. Liked everything No problems whatsoever. I liked everything about the property. Wonderful staff Great breakfast buffet Prompt and excellent room service Quiet property Easily accessible to downtown within a few minutes. There wasn’t anything we didn’t like. All the staff were professional friendly and genuinely enjoyed assisting. An excellently positioned boutique style hotel. Staff were so happy to assist and each and every one of them made a wonderful contribution. I could happily recommend this establishment. Great breakfast buffet with a very good selection of food. Rooms were a very good size for a city hotel. In a quiet position yet a brisk walk to the centre. I’d happily return. The hotel location was perfect, the staff was nice and the breakfast has surprised us, it was just right.